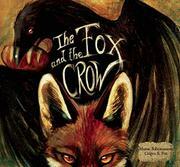 A melodramatic take on the Aesop fable with dark, strongly brushed artwork and equally expressive language. “When the moon slithers into the open skies, surely some trickery is afoot.” The charged exchange between the crow with the stolen bread in his beak and the trickster fox below is entirely nonverbal: “Their eyes meet. A challenge is spoken.” Fox howls (“Oh, she’s a temptress, that one,” comments the narrative). As “[a] song is an invitation[,] Crow must sing back.” In consequence, even as “Crow’s pride sets his hunger ablaze,” Fox snatches the fallen bread with a smirk, and her “tail teases as she swishes away.” The big, spread-spanning nighttime scenes are mostly close-ups, often just headshots of the sly rivals (and an owl, looking on inscrutably) limned in thick swirls of light and shadow. Floating musical notes to symbolize the “song” add an incongruous (and superfluous) element, but they don’t detract significantly from the brief encounter’s intensity. The moral goes unstated, and in contrast to more-conventional versions, the interpretation suggests higher stakes than just a lost meal. Discuss.